Three private residential sites were being put up for tender yesterday and could possibly yield a total of 1,955 new homes. Amongst the listed plots, market watchers expect the Woodleigh Lane site to be the most highly contested site and is likely to draw strong interest from as many as 10 to 16 property developers – with a top bid coming in at between S$473 million to S$524 million, or S$750 to S$830 psf ppr. The 210,403.9 sq ft site is situated just next to Woodleigh MRT Station and is adjacent to the upcoming Bidadari New Town and it is also within close proximity to key amenities – for instance, NEX mega shopping mall at Serangoon Central, and also other various top educational institutes – Cedar Girls’ School, St Andrew’s Village and also Maris Stella High School. The 2nd site for tender is situated at Serangoon North Avenue 1, which is relatively close to Hundred Palms Residences – an upcoming EC launch by Hoi Hup Realty. Despite not being close to any MRT stations, the site also has a vast land area of approximately 249,614 sq ft. It is located within close proximity to the French International School, schools such as Nanyang Junior College and Rosyth School, and it is likely to attract the young families and yuppies who are born and bred in the Serangoon Garden precinct for most of their lives. According to analysts, the winning bid for the Serangoon North Avenue 1 site could be as high as S$393 million to S$439 million or S$850 to S$950 psf ppr. The above 2 sites are on the Confirmed List, under the Government Land Sales (GLS) 1H 2017. 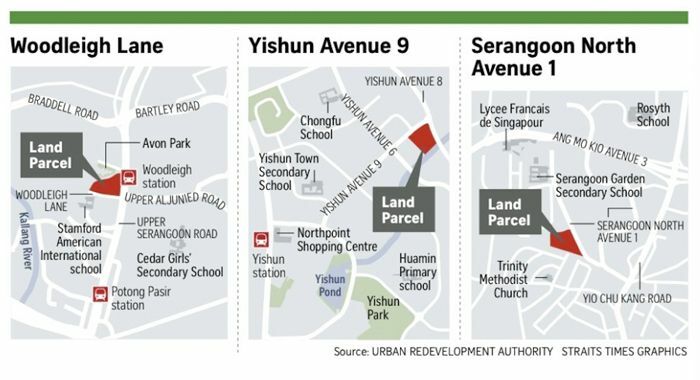 The 3rd subject site (on the reserve list) is located at Yishun Avenue 9, spanning across a land area of approximately 231,585 sq ft. The demand within the area has been pretty much tested by 2 earlier new launch projects – Symphony Suites (under construction) and Nine Residences (completed in 2016). Although it’s significantly further away from the Yishun MRT Station, the estate and surrounding is pretty well-established with malls and schools. However, it’s located near to large industrial buildings and factories, which analysts believed that it could diminish the appeal of the site. Thus, market watchers are expecting the top bid to come in between the range of S$311 million to S$350 million, or S$480 to S$540 psf ppr – which may still draw potential upgraders to the future new launch project, given its affordable price tag.